The Reverend Dr Mark Short has been elected as the eleventh Bishop of the Anglican Diocese of Canberra and Goulburn. The Electoral Synod, or ‘parliament’ of the diocese, came together over the past two days (Nov 9 and 10) in Goulburn, NSW, to elect The Reverend Dr Mark Short. The synod consisted of 124 clergy and 175 lay representatives from across the diocese, voting according to a set of church rules for electing a bishop. 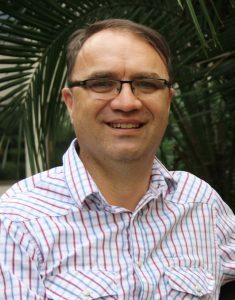 Mark Short is currently National Director, The Bush Church Aid Society, and was formerly Rector of Turvey Park and Archdeacon of Wagga Wagga in this Diocese. Educated at Moore Theological College and the University of Durham, UK, he became an Anglican priest in 1997. Formerly he worked as a Graduate Economist for the Commonwealth Department of Industrial Relations and Journalist for the Sydney Morning Herald. Mark (51) is married to Monica and they have two children. Mark’s other interests include bushwalking, train travel and reading. He will be consecrated and installed in a service at the Diocesan cathedral of St Saviours in Goulburn early in the New Year. ‘Mark brings to the position a wealth of experience in national ministry with oversight and pastoral care of gospel workers across the country, as well as in parish ministry to regional and rural areas, where he has worked to develop sustainable and engaging ministry models,’ said Synod Chairman, Bishop Trevor Edwards. ‘It is the role of the Bishop to provide leadership, care and vision for Anglicans within the Diocese and to represent the church to the wider community,’ Bishop Trevor Edwards said.